NASA's InSight Mars Lander Almost Didn't Happen. Here's How It Was Saved. Artist's illustration of NASA's InSight lander on Mars. InSight is scheduled to launch on May 5, 2018. NASA's next Mars mission almost didn't happen. A slow leak in the vacuum container surrounding the seismometer instrument on the InSight Mars lander — which launches no earlier than Saturday (May 5) — forced mission managers to call off its initially scheduled launch more than two years ago, in March 2016. And fixing the problem put InSight significantly over budget. The instrument has three long-period (or very broad-band) seismic probes housed inside the dome, which need to be maintained at a vacuum to ensure correct measurements, according to the French national space agency CNES, which built SEIS. A defective weld, however, caused a leak in 2015 that had engineers scrambling to fix the problem. 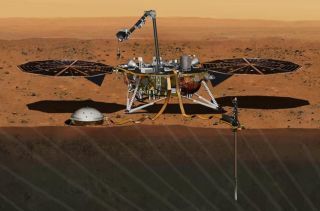 Artist's illustration of InSight's Seismic Experiment for Interior Structure (SEIS) instrument on the Red Planet's surface. In a televised NASA news conference Thursday (May 3) at Vandenberg Air Force Base in California, InSight principal investigator Bruce Banerdt said the leak was tiny. In a typical car tire with the same leak rate, it would take about 50 years to register a 1 pound-per-square-inch difference. But in a delicate seismometer, "it upset the apple cart in terms of the sensitivity," Banerdt said. The greatest concern, he continued, was trying to ensure the instrument would work between the day and night cycles of Mars, which have an average 170-degree-Fahrenheit (94 degrees Celsius) temperature swing at InSight's planned landing site near the Red Planet's equator. "We tried to fix it, but what we were using to patch it had to be able to withstand these huge temperature extremes," said Banerdt, who is a geophysicist at NASA's Jet Propulsion Laboratory in Pasadena, California. "We were not able to do a confident enough job that we were going to be certain it would work on Mars. It was much more prudent to stop." Stopping meant calling off InSight's planned March 2016 launch and waiting another 26 months to fly to Mars. This lengthy delay is caused by orbital dynamics: Mars and Earth align favorably just once every 26 months so that a spacecraft can fly between the planets using a minimum of fuel. "That's all forward work," John Grunsfeld, who was then associate administrator for NASA's Science Mission Directorate, said during a Dec. 22, 2015, teleconference, referring to InSight's fate. "We just haven't had time to work through that because our focus was on getting ready to launch." A few months after the leak occurred, Banerdt's team returned to NASA senior management with a process for redoing the balky seismometer. "We put together a solid plan to show we would fix this in plenty of time," Banerdt said at Thursday's news conference, adding (with a laugh) that NASA monitored him very carefully through the fix. He offered few details as to how the redesign took place but said the goal was to make sure SEIS was even stronger than before, with an enhanced ability to maintain the needed vacuum conditions. Meanwhile, NASA considered InSight's science potential and whether the mission was important enough for the agency to accept reduced opportunities for new projectsbetween 2017 and 2020 — a possible consequence of keeping InSight afloat. InSight's unique focus helped the mission here, team members said. NASA has sent numerous surface craft to Mars over the years, including (most recently) the Spirit and Opportunity rovers, which landed in 2004; the Phoenix lander (2008); and the much larger Curiosity rover (2012). These missions, however, were focused on surface weather and processes, answering questions such as whether there was liquid water on Mars in the ancient past. Exoplanet science is a big deal, and it's only getting bigger. For example, NASA just launched the Transiting Exoplanet Survey Satellite to hunt for alien worlds around the sun's nearest neighbors. InSight will also provide valuable information for human exploration of the Red Planet — a key goal of NASA, said agency Chief Scientist Jim Green. He drew an analogy with earthquake-prone Southern California, where structures must be built to withstand seismic shakes. "How quake-prone is Mars? That is fundamental information we need to know as humans then explore Mars," Green said during Thursday's news conference. "The scientific basis of this mission — not only the planetary science, but human exploration — was a factor in the decision to keep things going," he added when asked about the decision to continue InSight. The instrument fix and two-year delay added $153.8 million to InSight's price tag, NASA officials have said. "The additional cost will not delay or cancel any current missions, though there may be fewer opportunities for new missions in future years, from fiscal years 2017-2020," NASA said in a statement in September 2016, when the new InSight launch date this year was announced. InSight has a 96- to 98-percent probability of launching either Saturday (May 5) or Sunday (May 6), Vandenberg officials said at the news conference. The window on Saturday opens at 7:05 a.m. EDT (1105 GMT, 4:05 a.m. local California time). InSight's overall 2018 launch window extends until June 8. If you are unable to see the launch in person in Southern California, you can watch it live on Space.com and the NASA TV websites. Regardless of the launch date, InSight will touch down Nov. 26 on Mars' Elysium Planitia.